The backdrop for the stage at Kelling Heath in Norfolk really brings the forest into the room. It's just like playing outside but warmer, dryer and with a better acoustic. My good friend Rick took some pics during the second set and also a few movie clips which may (or may not!) appear in a later post. I'm not sure what tune we're playing here. Something with a lyric, that's for sure. 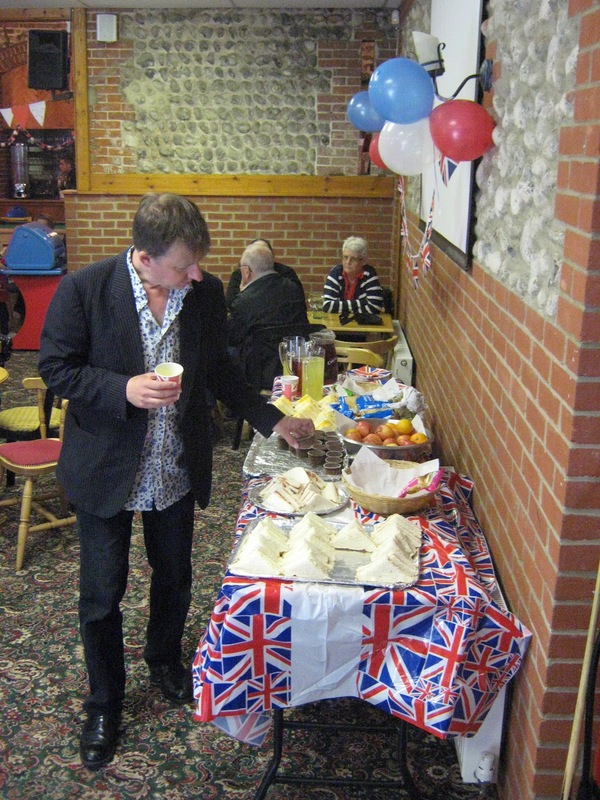 We go down well in Kelling, whether we play swing, Latin or klezmer. Eastern Straynotes didn't miss the party last weekend but, as usually happens, Jonathan was almost too busy to wield his camera. At Forest Park, Cromer much of the time was spent setting up out on the new decking where we played our first set and pulled a fair crowd to the barbeque. But then it began to rain so we spent our first break moving the gear inside for our second set. And then out came the sun again. So we spent the second break taking the gear back out. Except half way through doing that it began to rain again so we brought it all back in. By the time we had started our third set (indoors) it was sunny again and remained so. Ah well, you have to laugh don't you? At least our jazz and klezmer-loving audience followed us on our meanderings. 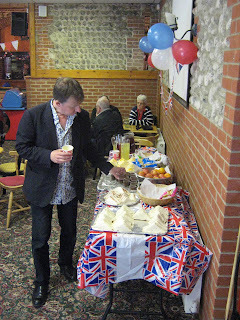 And Andy still found time to check out the Jubilee spread. "Here's looking at you, cupcake."